Sara Sheridan is a Scottish writer who is the author of the Mirabelle Bevaan series which are set in London and Brighton. She also writes a set of novels based on the real-life stories of late Georgian and early Victorian explorers and adventurers. She is a member of the Historical Writers Association and the Crime Writers Association. Sara also mentors for the Scottish Book Trust. I was an historical novelist first of all. I never intended to write a crime book, let alone a whole series. It was about three years ago and I had finished the first draft of an historical novel set on the Arabian Peninsula in 1833 (Secret of the Sands). I was waiting for the editor to get back to me with her amendments and I had a few weeks on my hands. I was spending the time reading. Then I went for lunch with my father. I wondered too. On the way home I thought I might write a short story about this crazy lady, stalking around the pebbles in high heels to avoid paying tuppence. I thought it was going to be a comedy. I’m a swot though – through and through. So instead of starting to write straight away I went to the library. I’d never studied the 1950s but I thought I knew about it. After all I was born in the late 1960s – I thought I must have some kind of folk memory. I was wrong. What I discovered was a different world, a little like walking into a house I knew well which had been refurbished. It was Britain, but things were completely different. For a start, there was massive poverty. The whole country was poor. We’d just come through the war and the US had called in its debt – if we think we have Austerity now, we’re joking. There was massive homelessness because the housing stock hadn’t been rebuilt up after the Blitz. In London quarter of a million homes had been destroyed. People were hungry – there had been rationing for years and food was scarce. And then there were the secrets. People had lived through WWII and had done some terrible things – and brave things too. There was no therapy – not much help for those trying to recover from the emotional scars the war had left behind. Quite apart from that almost everyone had been bereaved. Things were very tough. As a nation we were scarred and our scars hadn’t yet healed. On the upside there was this tremendous optimism – the NHS had just been set up and things were getting better. I got a real sense of that from video footage of the period. People felt this was their time. I watched some of the Pathe archive properties with a friend who works for the BBC. He was researching British childhood. There were people saying ‘I’m going to get what I want now. I’m going all out for a new life.’ ‘Look,’ my friend said, ‘it’s the beginning of the me generation.’ It was, in a way, but what these people meant, of course about having it all was that they wanted food – they’d had enough of rationing. They wanted a second winter coat. It made a lot of sense of my parents’ and grandparents’ glee over sweets – their pride when we were kids at providing a slap up meal. This was somewhere we’d come from that I didn’t know about. Truthfully, it was compelling. I realized that woman on the beach that Dad had seen wasn’t crazy. She was scarred – like so many people during the period. She was trying to get over whatever she’d been through. And I wanted her to recover from her War. It wasn’t going to be a comedy. It was going to be a mystery. With all those secrets dotting around, it had to be. I went back to the classics of the period. Agatha Christie was the obvious one, but there were plenty of examples. Cosy crime. The genre has a bad name for being toothless. Culturally we’re disposed towards police procedural and forensic crime these days. Reading Christie and her contemporaries, though, with fresh eyes I realized there had been a huge misunderstanding. Their stories weren’t toothless at all. For a 1950s reader they were deeply shocking – they featured divorcees, extra-marital affairs, homosexuality – all things subject to huge changes in cultural understanding over the generations since. For a modern reader the stories might seem tame but for a contemporary reader they were edgy. I decided I wanted to revitalize the genre. I wanted to write crime that wasn’t forensic – an old fashioned mystery that was in tune with the period – but with material that was gritty for a modern reader. For that I went back to the archive. There was so much! Not homosexuality or divorce stories but simply the way men talked about women and white people talked about black people. To the modern eye the sexism and the racism of the period feels savage and shocking. It marked up to me how much our world has changed and, for that matter, it has given me new respect for my parents and grandparents because they were the people who instigated those changes. Those generations changed our world. So there I was. I wanted to write a mystery that would communicate this fascinating decade – a decade that was seminal, bridging the old world, if you like of post-Victorian empire with the new – the swinging 60s. A decade when the country recovered. And when it came down to it I realized that wasn’t one book. People didn’t recover that quickly. So I took that woman on the beach and named her Mirabelle Bevan. I gave her a difficult war and the trauma of losing her true love, of finding her life decimated and struggling to get back to her place as a woman at a time when being a woman was horribly restricted. That was important. Women had worked during the war. They had contributed. And afterwards they were expected to go back into the kitchen. I introduced Mirabelle to a black girl who worked in an office down the hallway from the debt collection agency where she has landed. At the beginning of Brighton Belle she’s depressed, really. And then she discovers that she can recover. She has value. That the world needs her. It’ll take that decade, but I’m giving her confidence back, her faith in herself – book by book. Story by story. I’ve always written stand-alone novels before. The beauty of a series, as a writer, is that the landscape is so broad. At one book a year I’ve got 11 mysteries to do it. I’ve written three so far. I can drop a character in one book and pick them up further along. I know what I’m going back to when I sit down to write. It’s fun, actually. And I’ve started writing short stories about Mirabelle’s discoveries and adventures in between the books. I’m enjoying the detail of that. And the readers are amazing. It’s a whole different relationship, as a writer when readers relate to your character and want to come back to her again and again. Last autumn the first book, Brighton Belle, knocked 50 Shades of Grey off the Amazon ebook No 1 slot. That was fun. Mirabelle was up there for 3 days. 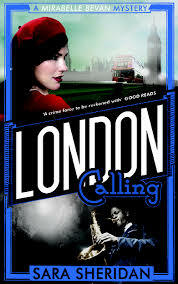 I hope readers respond to London Calling just the same! Sara Sheridan’s Mirabelle Bevan Mysteries are published by Polygon. 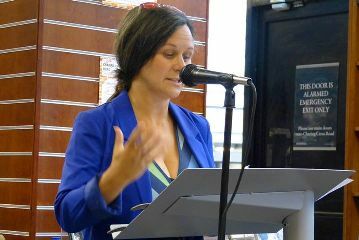 You can follow Sara on Twitter @sarasheridan or on Facebook as sarasheridanwriter.